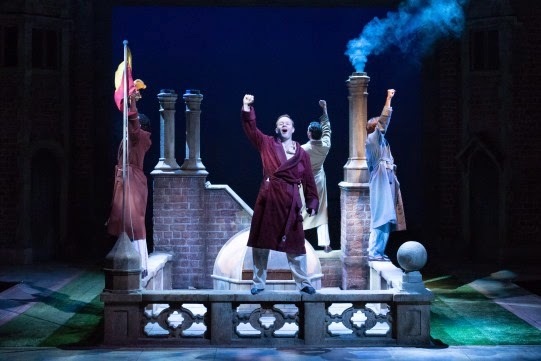 I can’t remember whether it was a cineworld email or one of the various theatre emails I receive that told me I’d be able to catch this offering from the RSC at my local cinema but I’m extremely grateful that I found out. I was laughing from the start, completely caught up in the story and had tears in my eyes at the end, when the four men, clad in uniforms marched away from their beloveds. 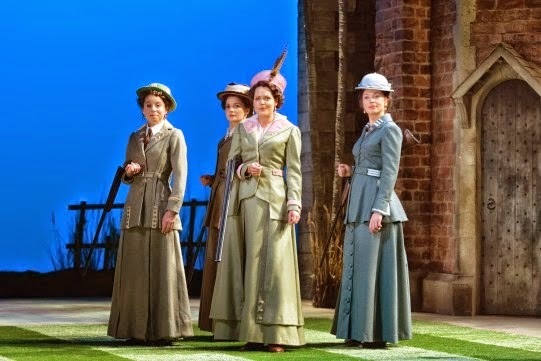 This version of the comedy (one I’ve not seen performed before) is set in the summer of 1914 – the last idyllic Edwardianesque summer before WWI changed the face of Britain forever – which made it a must see for me, with my interest in the period in question. Interestingly (and in a move that is quite different to any production of a Shakespeare play I’ve seen before) they chose to stage the play as if it were happening in Charlecote Park, a real stately home that was built in 1558 (Shakespeare was supposedly arrested for poaching in the grounds as a young man) and has been inhabited ever since (although the National Trust has run it since 1946). 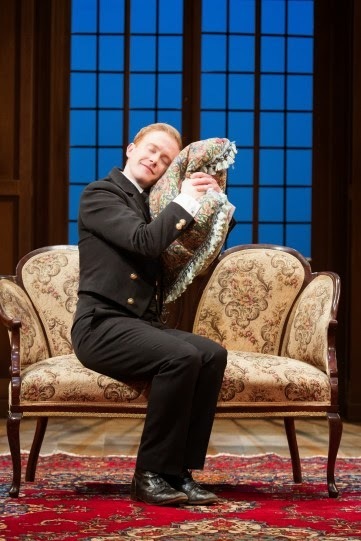 This meant that, since I spent three years at Warwick University and often visited Charlecote, I felt a sense of familiarity from the moment I set eyes on the stage. The attention to detail of set and costume was, as it always is with the RSC, fantastic. I was extremely taken by the hunting suits of the women and I believe was the insignia the men had on the collars of their uniform was that of the Royal Warwickshire Fusiliers, which is the regiment that they would most likely have joined if they’d really lived in Charlecote Park and volunteered in August 1914. The lovely bit about seeing the production in the cinema is that you get some behind the scenes footage and this time we got to see how Simon Higlett, goes about designing the sets. I was completely in awe of his model making talent and would happily pay to own one of his minature versions of the sets. Christopher Luscombe, the director, really did an excellent job. 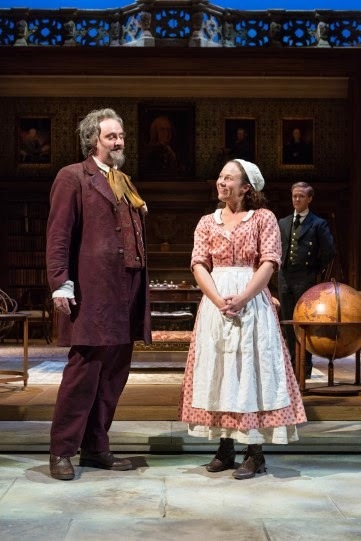 The movement, pacing and use of music (Nigel Hess wrote a fabulous score) meant that the sense of fading Edwardian glamour pervaded the play and, somehow, set off Shakespeare’s words in the same way certain clothing can elevate a beautiful piece of jewellery to sublime new heights. However, as always, it is the cast who really make the play and this cast was spectacular. Edward Bennett and Michelle Terry sparkled as Berowne and Rosaline, Tunji Kasim was glorious as Dumaine (and his teddy bear deserves a mention because it added an extra dimension to the rooftop scene and had me giggling like an idiot), however the real stars of the show, for me, were Peter McGovern and John Hodgkinson, who played Moth & Don Armardo respectively. They were an excellent double act, absolutely hysterical in several scenes and had a real chemistry about them that had my friend and I turning to each other at one particular moment and going “I ship them”. I shall definitely be looking out for them in future productions. The RSC have paired this production with Much Ado About Nothing (under the title Love’s Labour’s Won – a nod to the theory that Shakespeare intended Much Ado to be a follow up play to LLL and that Much Ado About Nothing was actually the strap line for the real title of Love’s Labour’s Won), which will be set the aftermath of WWI, and performed by the same cast. Happily this is also be live broadcast in cinemas, on 4th March, and I’ve already bought my ticket. 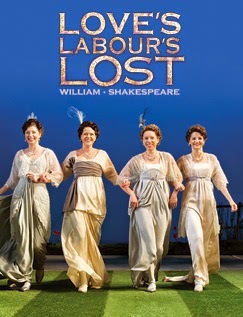 Love’s Labour’s Lost plays in Stratford until 14thMarch 2015. If you can get there, I recommend you do – tickets are on the RCS’s website here. ← Gay’s the Word: A bookshop that’s just as a bookshop should be.